Le Bernardin in New York City is kind of a big deal. It was Zagat’s 2012 top pick for New York City restaurants, it has three Michelin stars and The New York Times gave it four stars. With accolades like that, it would be surprising if anything wasn’t amazing, so it almost goes without saying that they make a mean cocktail. The cocktail list is a fine-tuned menu that changes seasonally using fresh ingredients to blend modern and traditional tastes. Since you don’t go all the way to Le Bernardin without trying at least a couple of cocktails, I went ahead and ordered two different drins. The first was the Brooklyn Bee, an adorable name for the drink that is a mix of Brooklyn gin, lemon, lavender honey, champagne and absinthe. The result is a delicious, well-balanced, slightly effervescent drink, which despite featuring several types of alcohol, doesn’t taste at all strong. It’s the type of cocktail that goes with just about anything and that you want to keep on ordering, but I decided that I had to try at least one other option. For my next drink, I went with the indulgent LB Champagne Cocktail, which combines Roederer Champagne, lemongrass, black pepper, St. Germaine and lemon. Like the Brooklyn Bee, it contains champagne and lemon, and it is isn’t too sweet, as the lemongrass and black pepper provide a sophisticated balance to the other ingredients. Served in a beautiful flute, it definitely encompasses the essence of Le Bernardin. 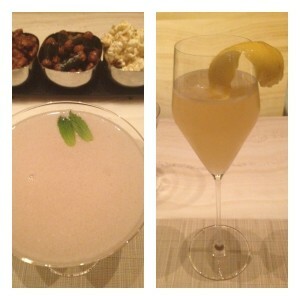 Two great cocktails, one great restaurant.